So we’ve made it through February and into March. Hopefully yours came in like a lamb, and not like the angst-filled El Nino, raging drunk and coked out of his goard, that we’ve been hearing about! Multi-platform apps begin at the (2:29) mark of the podcast. Hound by SoundHound, Inc., free (iOS, Android). So, that’s just one of several predictions that Spielberg’s vision of 2015 might have missed on slightly. But only slightly. The advent of the smartphone has brought hands-free digital assistants into the regular lives of millions. “Hey Siri” has become a part of the American vernacular, despite growing pains. However, competition in the digital assistant area has generally been limited to the services offered by your phone’s OS – Siri, Google Now, and Cortana. Hound is a new digital assistant app that might just signal a changing of the guards in this area. Providing extremely fast (as in, faster than Siri, Google Now, or Cortana) responses to complex, nested natural language queries – with accurate, location-based results – Hound is potentially a game changer. It can do just about everything that your smartphone’s built-in digital assistant can do, oftentimes better. Skype by Microsoft Corp., free (iOS, Android) (Update). Microsoft’s video-conferencing app Skype announced a significant update last month – group video calls directly from your mobile device. Although group conferences have been available for the desktop versions for some time, bringing this functionality to your mobile device dramatically increases Skype’s utility. In addition to the basic group conference ability, Skype also added two new options for viewing the conference: a grid view and a “primary speaker” view. The grid view – as should be painfully obvious – is a grid. Good for conferences with a handful of participants, the grid view will definitely become unwieldy when you approach the 25-person limit. The “primary speaker” view, on the other hand, focuses most of your screen on one person, while the others are collected in a small, scrollable row. The cool part about the “primary speaker” view is that users have the option of “pinning” one person to always appear in the main view, changing who the “pinned” speaker is, or using Skype’s default setting, meaning Skype will actively change who is featured based on who is doing the most speaking. Bing by Microsoft Corp., free (iOS, Android) (Update). iOS apps begin at the (9:16) mark of the podcast. Notarize by Notarize, Inc., free. So, I feel like every month there is a new app that is an uncomfortable fit for my list. 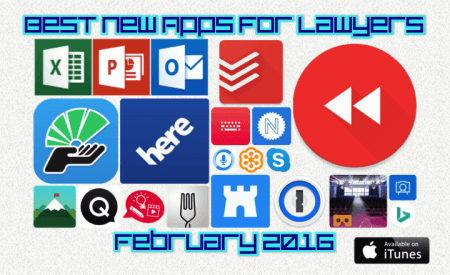 See, I try to only include apps that will be 1) interesting, helpful or entertaining to lawyers, or 2) involve something that lawyers need to be aware of/look out for. Notarize actually straddles those two categories. Based on Virginia law, Notarize allows users to upload a document, prove your identity, and connect with a licensed Virginia notary via video call. You are then able to “sign” before the agent, who is then able to legally notarize the signed document. The app’s designers state that its process is legal based on Virginia’s “remote electronic notarization” legislation, and that the Full Faith and Credit Clause makes any such notarization valid nationwide. This app could be highly useful – assuming it’s legal – to both lawyers and non-lawyers alike. How many times have you been unable to get a notarized verification back from your client to send in discovery? That’s right – EVERY TIME. Regardless, lawyers need to be aware of services like this one, in the event they ever need to challenge a notarized signature. My favorite task management system released a major update last month to all of it’s iOS and Mac apps. For iPhone, ToDoist is now 3D Touch enabled, allowing users to quickly view today’s tasks or add new tasks directly from the home screen. Within the app, 3D touch allows you to preview a website link without leaving the ToDoist app. Another iOS 9 update is the new Deep Linking feature – when you open a ToDoist link on your phone, it will open in the app instead of using your browser to open the ToDoist website. Avoiding switching between apps is quite nice! Other updates include the ability to reply to comments on a task directly from the notification, Spotlight support that makes it easier to find a task right from your home screen, and a complete revamp of ToDoist’s Apple Watch app (for more, check out the podcast!). Quartz by Quartz Media, LLC, free. How do you keep up with the day’s important events? Some have a favorite news reader, some use Twitter, some use a more traditional news source. Individual preferences concerning how news should be delivered is quite varied, and new apps are regularly being released that use new and creative methods to keep you informed. Enter Quartz, a news app that believes a conversation is the best way to get your news. Quarts sends you messages, photos, links, and more, and you decide what you’re interested in reading more about. Notifications are relevant to your news preferences, and are totally customizable, with stories curated by actual human journalists (it’s kind of funny that the “human curation” thing is becoming such a big selling point, but I digress). Run out of news stories? Quartz will give you a quiz or a puzzle to keep you entertained. Apple Watch owners will even get emoji notifications about the status of the stock market. Overall, Quartz is an interesting and oddly entertaining way to get the news. Doo by Ciarlo Software, LLC, $4.99. Yes, I realize that task management apps are basically a dime a dozen for mobile devices these days. However, when I see something interesting or helpful, you’re going to hear about it, even if I might wince a little at the price. Why do to-do lists exist? Because we have things to do. Why do they fail? Because too often, we focus on the end result, making many tasks seem huge and overwhelming. Doo wants to completely re-wire your concept of task management, making any goal achievable, by shattering your tasks into tiny pieces. Doo places your to-do list into a stack of cards, each with one small, achievable goal. You set your reminders, and each becomes a new card – if your project seems too big, Doo will prompt you with ways to manage the task in smaller pieces. Displaying one card at a time, you swipe away tasks as you complete them, giving you a manageable way to power through your to-do list. UberEATS by Uber Technologies, Inc., free. Hey, everybody’s gotta eat, right? UberEATS gets you the food you want from the restaurants you want, fast. Be honest, how many times have you been sitting in a deposition, mediation, or other meeting, and looked at the lunch or dinner options available and gone with “none of the above” for reasons completely unrelated to hunger? If you’re anything like me, it’s too many. Sure, there’s only limited availability now (LA and Toronto, with Atlanta, Austin, Chicago, Dallas, Houston, NY, SF, Seattle and DC coming soon). But it’s Uber. They’ll be in your neighborhood soon enough. Victories by LittleQuest, Ltd., free (limited time). HERE Maps by HERE Apps, LLC, free (Update). Android apps begin at the (21:09) mark of the podcast. Hub Keyboard by Microsoft Corp., free. I could say that I can’t get enough of Microsoft’s Garage project’s apps, which is true. However, there’s a reason they keep ending up on my monthly lists – they’re unique and creative. And they’re being produced at a breakneck pace! Newest on the list is the Hub Keyboard. Designed to make performing actions in different apps more efficient, Hub Keyboard brings information from various services right to your keyboard, meaning you don’t need to waste time switching between two different apps that were supposed to make your life easier. Hub Keyboard allows you to insert recently copied items, grab and share URLs of Office 365 documents in OneDrive and SharePoint, share information for contacts in your phone or Office 365 account, or even translate what you’re writing into a different language. Essentially, it puts your entire Office 365 collection (files, clipboard contents, contacts, etc.) right on your keyboard. I really do love useful things! 1Password, one of the best overall password management systems, sent out a massive, and much needed update to it’s Android app last month. Looking more like a new app than a simple update, 1Password’s Material Design makeover gives the app a cleaner and easier-to-navigate design. The update wasn’t just for looks, though. Finally, 1Password for Android now allows for biometrics (i.e. fingerprint) use on phones with the technology built-in. Additionally, the updated version includes the option to join the BETA test for 1Password for Teams, a great way to share secure, complex passwords with your team. Public Speaking for Cardboard by Virtual Speech, free. Virtual reality will fundamentally change the way we approach a lot of things in life. One of the first uses that VR has been put to is to allow people to experience a situation without having to be there live. This type of tool has been helpful for the treatment of PTSD in the military, and allowed people afraid of heights to ride a roller coaster… on their couch. Public Speaking takes that same concept and applies it to public speaking. Whether you’re looking to overcome extreme crowd anxiety, or just want to practice an upcoming presentation or trial, Public Speaking is an amazingly innovative tool to help. Using Google Cardboard, Public Speaking recreates a photo-realistic environment for your training. Using either a large conference room with 300+ seats or a small meeting room of 15, you get an animated audience, moving and behaving as they would in a real event. Ambient sounds replicate the event, immersing you in your surroundings. You can even upload your own slides to appear in the presentation within your Virtual Event. Seriously, how freaking cool is this? GoToMeeting by Citrix Systems, Inc., free (BETA). While Skype and Google Hangouts have made considerable progress in the development of their video conferencing systems for business, GoToMeeting has been the standard bearer for a while. However, Citrix’s system lacked some of the innovation that Microsoft and Google brought, and the lack of an effective mobile version has been a handicap. While this is technically a BETA release, those days appear to be over. Host or join a GoToMeeting session from wherever you are using your Android device. Sure, that was implicit, right? For lawyers, though, the big thing is going to be what GoToMeeting’s standard platform always provided better than Skype or Hangouts – sharing and interacting with documents and presentations. Yep, it’s time to bring your remote deposition to your living room couch! Rewind: Reverse Voice Recorder by Yu Chen Hou, free. How many times in a day to you run into a situation that, in hindsight, you really wish you’d recorded it? Not necessarily for professional or punitive reasons. Sometimes you’d like to remember specifics. Mostly, though, you’d just really like to enhance your “I told you so” with the other person’s own words. Or maybe it’s just a good idea that you know about an app that passively records everything going on. All the time. Either way, you should know about the new app Rewind. It continuously runs in the background and passively records your surroundings, allowing the user to save anything they feel was important. Although the app suggests it’s great for brainstorming and recording memos, it also grudgingly acknowledges what it’s really going to be used for. Draw My Story by Quartex Technologies, Ltd., free. Speedify by Connectify, Inc., free. Windows Phone apps begin at the (30:28) mark of the podcast. Microsoft Excel, PowerPoint & Outlook by Microsoft Corp., free (Update). Outlook: The best updates of the month come to Outlook. Users are now able to add holidays to their calendar, and view an entire year at a glance on their mobile devices. Additionally, new swipe gesture tools allow for moving messages to any specific folder, and users can now add attachments to an email by pasting it to the body of the email itself. Excel: Mobile users of Microsoft’s spreadsheet program will now be able to utilize some of the enterprise-based tools from the desktop version – converting a table to a range of numbers and merging groups and outlines. PowerPoint: You are now able to pin your favorite files directly to your start menu for quick access. Another cool update is the ability to insert a picture onto your PP slides directly from your camera. Take a picture and it immediately appears in your presentation. ToDoist by Doist, Inc., free. As I’ve said many times, ToDoist is my favorite of the available task management systems on the market, and it’s finally bringing a native app to Windows Phone. You can now manage your task list, access file attachments, collaborate on shared projects, and everything else ToDoist has to offer, right from your Windows Phone. However, like many Windows Phone apps, this app does not come close to either the iOS or Android versions for functionality, which is discussed in greater detail in the podcast.